Hampshire alum David Shulkin, one of the most accomplished physicians and medical executives in the nation, was unanimously confirmed across party lines by the Senate in February and is now serving as US Secretary of Veterans Affairs. 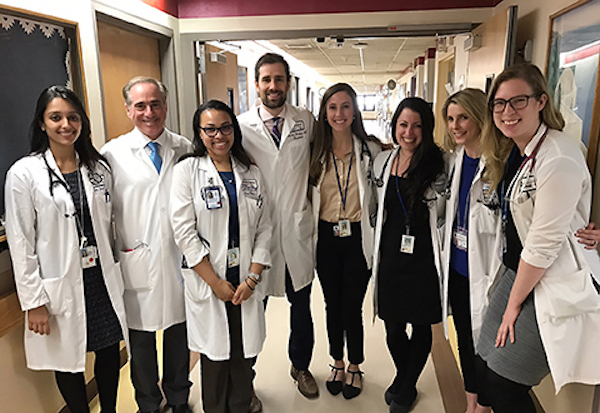 Secretary David Shulkin, second from left, participated in patient rounds at a VA medical center in February. Shulkin was originally appointed to the Department of Veterans Affairs by President Barack Obama. Since 2015, as Under Secretary for Health and Chief Executive of the Veterans Health Administration, he has overseen an agency that cares for nine million military veterans and managed the nation’s largest health care system and largest provider of graduate medical education. Professor Emeritus Ray Coppinger, one of Shulkin’s faculty advisers, remembers that he wanted to become a doctor, so they worked together to design a personalized premed program; Shulkin earned his undergraduate degree in science from Hampshire in 1982 and his medical degree from the Medical College of Pennsylvania. He is among the proportion of Hampshire alums who graduate from the College’s rigorous program and progress to earn the most advanced degree in their field. According to federal data, Hampshire ranks in the top 1.4 percent of US colleges whose graduates earn a doctorate. In 1980, halfway through his studies at Hampshire, Shulkin was featured in a New York Times article about the College’s distinct model of project-based learning. Shulkin’s project was a self-designed science experiment using his refrigerator to investigate how fish survive in frozen ponds and lakes. The Times reported that this was the beginning of Shulkin’s systematic scholarly analysis of gill movements and cellular structures. In his final year, in the School of Natural Science, Shulkin researched and presented a Division III thesis on whether a pharmaceutical could be used to slow or stop aging. Specifically, he examined the effects of centrophenoxine on the age pigment lipofuscin in the cells of roundworms. (The drug is used to improve memory and cognition.) In his conclusion, Shulkin reported he was not able to determine if centrophenoxine has an impact on the aging process, but he expressed a goal for researchers to learn more about lipofuscin with an eye toward eventually slowing the aging process. The chair of Shulkin’s Division III faculty committee was Professor Emerita Nancy Lowry. She says she became close friends with him after he took her organic chemistry course. “He was definitely a student with a sense of direction, moral purpose, and a sense of humor, a really nice young man,” she says. “He has always stood out as one of my more memorable students. He was honest, and we had interesting conversations on difficult topics he brought to me.” Lowry wrote a recommendation when he applied to medical school. Shulkin contributed his thesis to Hampshire’s Library, which now holds 3,400 student Division III papers, for public research. National media report that in 2015, in joining the Department of Veterans Affairs, Shulkin left a seven-figure job in the private sector for a fraction of that salary. He had previously served in chief executive roles at Morristown Medical Center, Goryeb Children’s Hospital, Atlantic Health System Accountable Care Organization, and Beth Israel Medical Center, as well as chief medical officer of the University of Pennsylvania Health System and Temple University Hospital. He has been named one of the “Top 100 Physician Leaders of Hospitals and Health Systems” by Becker’s Hospital Review and one of the “50 Most Influential Physician Executives in the Country” by Modern Healthcare and Modern Physician. Now Shulkin’s responsibilities are the greatest in his career. On the last day of February, during President Trump’s speech to a joint session of Congress, Shulkin was assigned by the White House and prepared himself to be the “designated survivor” to become president of the United States in case of a catastrophic event. National media covering the agency report that Shulkin’s ongoing challenges range from significant shortages in staffing, including nurses and doctors, topping 40,000 unfilled positions; pressure from veterans group looking for improvement from the agency after a scandal and cover-up three years ago in hospital wait times and delays in appointments; and implementing services to reduce the exceptionally high rate of suicide among veterans. 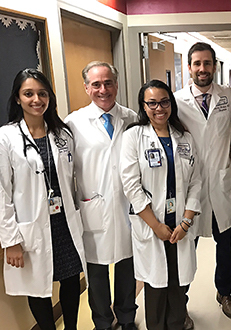 Soon after being sworn in as Secretary, Shulkin returned to traveling to VA medical centers around the nation, here participating in patient rounds in February at VA NY Harbor Health Care System.